The CONSUMER SOCIETY: Who was behind it and what is the real goal? Warning: Reading the following may be hazardous to your mental health. The material herein has caused readers to experience Cognitive Dissonance (CD). CD is the discomfort felt at the discrepancy between what you already know or believe, and new information or interpretation that contradicts a strongly held belief system – It’s that queasy feeling that rises in your gut and screams, I DON’T BELIEVE THAT! Because, if you accepted the new information, you would have to admit you been ”had,” or ”conned,” in this case into shopping for stuff to trash the planet. The benefit of the new information is that the world around you will finally make sense. Hot, flat, and crowded Thomas L. Friedman will finally know what planet George W. Bush is on. Bush lost the war on terrorism and the war in Iraq, but is winning the war on the environment. What follows is the history that has been intentionally left out of our textbooks. The historical research by Toqueville, Chartier and Hitchcock if examined without prejudice supports a prima facie case that the House of Rothschild orchestrated the French and American Revolutions to create the middle class (consumers) for the purpose of trashing the planet. If you were living in the 18th century looking for humans to consume the resources of the planet where would you find them? Answer: 95-97percent of the population of Feudal Society. The “Third Estate” had potential consumers but first they would need to be “enlightened” with a philosophy and movement based on respect for the dignity of man, concern for his welfare, and the creation of favorable conditions for a just social life. At the beginning of the Revolution, Kings, Monarchs and the despots of our history books held supreme power; by the time it ended, the human rights movement replaced centuries of tyranny and oppression for the common man. Roger Chartier writes in The Cultural Origins of The French Revolution, the popular notion that the Enlightenment caused the Revolution makes the mistake of post hoc ergo propter hoc – “after the fact, therefore because of the fact.” Thus, Chartier and other historians claim it was the French Revolution that made the Enlightenment. The Declaration of the Rights of Man is often seen as the quintessential Enlightenment document but the declaration called for a meritocratic social order, not an egalitarian one. Equality was conspicuously absent. The revisionists are consistent in dismissing the Marxist interpretation, but without a 20th century perspective on environmental damage they have no systemic theory explaining the events in late 18th century France. Ecocide was a pivotal and necessary part of the Rothschild plan for a New World Order. In the summer of 1789 when France rose up in revolt it wasn’t over intellectual, social or political issues; it was food. The country was in the midst of a famine caused by abnormal weather. The common man was having trouble developing his natural talent and potential because he was hungry. The rise of humanism and the social injustices in the 18th century did not create the revolutionary brew that saw the overthrow of the French monarchy. The House of Rothschild and the weather changed the course of history. 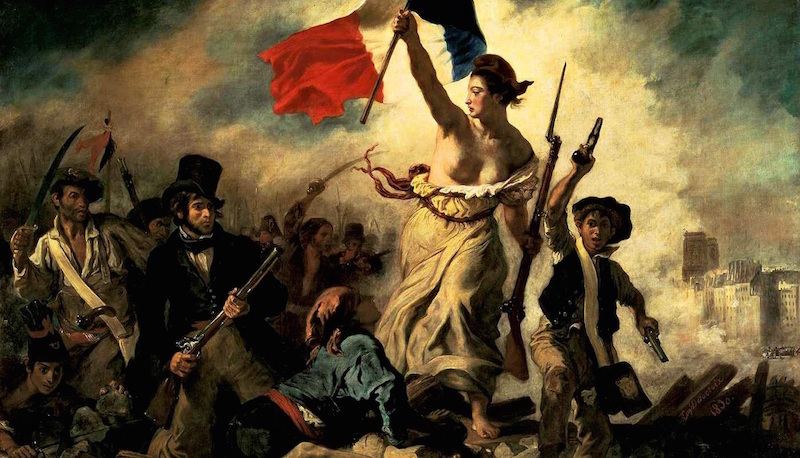 When the French government on the verge of bankruptcy from the seven years wars was unable to provide famine relief, public frustration erupted into violent demonstrations and the French Revolution. Of course most despots would call for an inquisition and blame the peasants for the worst El Niño episode in history. Why did the House of Rothschild allow the revolution to succeed? Answer: There were not enough consumers in the First and Second Estates in 18th century Feudal Society to weaken the planet. The vast accumulation of wealth, financial and natural resources of the House of Rothschild is legendary. Considered the turning point in history, exploiting the Battle of Waterloo gave the Rothschild family complete financial control of Europe, and soon after, the world. England would set up a new Bank of England, with Nathan Mayer Rothschild in control. And their real wealth, where is it now? Used up, as in consumed, by the middle class so former members of the Third Estate (serfs and slaves) could have houses, cars, RVs, TVs and DVDs—the affordable things we take for granted which put the planet on the bridge to Ecocide. One of the more absurd notions that found its way into the history books and the writings of economic experts, is that somehow the International Bankers (swindlers and scoundrels of history) were made wealthier accumulating the monopoly money they printed. The swindlers and scoundrels wealth, not yours or mine, was eventually “cut, mined and hauled away,” so that Americans could have that cheap stuff that is currently “trashing the planet”. During the last 100 years those swindlers were able to distort the structure of relative prices; generate misallocations of labor and capital throughout the economy; rationalize new governmental interventions in the face of the market “instability” manipulate the patterns of and the profits from international trade which resulted in the Industrial Revolution, the Great Depression, the stagflation of the 1970’s, the dot-com and the housing market bubbles…which resulted in unprecedented prosperity for the middle class… and $500 trillion of monopoly money for the House of Rothschild. Did Woodrow Wilson “ruin his country” when he signed The Federal Reserve Act of 1913 and made the middle class prosperous beyond precedent in the most powerful nation in the world? Yes, because prosperous beyond precedent was unprecedented environmental damage for the planet. Capitalism never made sense unless the goal was ecocide. The ideal and the principle of the market economy of Capitalism was never fulfilled. What is called capitalism is a distorted, twisted and deformed system of increasingly limited market relationships as well as market processes hampered and repressed by state controls and regulations. And overlaying this entire system are the ideologies of 18th-century mercantilism, 19th-century socialism, and 20th-century welfare statism. But when he claimed, “it is the principles and the meaning of a free-market economy that must be rediscovered” in order to overcome the burden of historical capitalism and save liberty, He should have written principles must be rediscovered in order to save the planet from ecocide. Even conscious consumers consume, as in use up the resources of the planet. Let me repeat, since 1910 the House of Rothschild and the Rockefellers have exchanged their real wealth for 600 trillion of fiat currency (monopoly money) they printed so former members of the Third Estate (serfs and slaves) could have houses, cars, RVs, TVs and DVDs—the “stuff” which put the planet on the bridge to Ecocide. Rockefeller philanthropy wasn’t limited to dimes. By 1850 the United States following the lead of England built their own industrial revolution around textiles. There arose a great demand for the one crop that does more damage to the environment than planting coffee or even tobacco… Cotton. Today, our planet is in desperate trouble. Earth is suffocating as large tracts of rain forests disappear. Pollution, poisons and chemicals are killing the planet. These problems could have been avoided if the British textile industry hadn’t “suddenly” discovered Cotton. August 25, 1814, British troops captured the nation’s capital during the War of 1812, setting fire to buildings in retaliation for American wins. A tornado struck as the government buildings burned, killing 30 soldiers and many local residents. One British historian noted, “More British soldiers were killed and wounded by this stroke of nature than from all the firearms the American troops had mustered in the ineffectual defense of the city.” The account in “Washington Weather” tells of a British admiral who asked a local woman whether the storm was typical of the weather “in this infernal country.” The lady told him that it was a storm specially sent by God “to drive our enemies from the city.” September 11, 1814 the decisive battle of the War of 1812.